There are 2 ways of informing your employees about the survey. Either they can download the app (for iOS or android) and receive push notifications or otherwise use the email function. When the survey has just opened, asking them to participate. A reminder nofication, if they haven't yet participated, depending on your settings. The last one once the survey has been closed, inviting them to take a look at the results. Those using the email function will receive an email with information about how to download the app (if they wish to do so ) as soon as they are added to the "Employees" section. On the first day of the survey, they will receive another email inviting them to take part in the survey and a reminder email is sent on the last day of the survey, giving them time to still take part if they haven't yet done so. 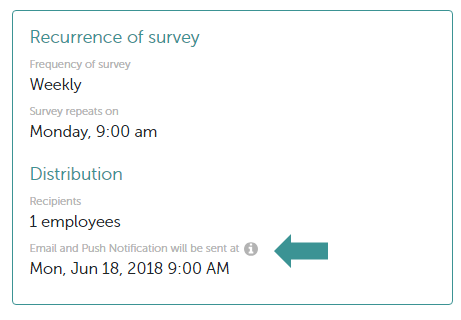 The information about when and how often the notifications will be sent can be found in the "Schedule" section of each new survey after clicking on "Go to activation", at the very bottom of the "Recurrence of Survey" section.